After missing the much hoped for weather during July and August, maybe we're in for a delightful September easing into a mild autumn? With the prevailing NW breezes recently, we've been paddling mostly on the South coast, and beginners have been enjoying the delights of Sugarloaf and adjacent Caves and the view of the Chasms from the sea. (ALL FOOT AND MOUTH RESTRICTIONS WERE LIFTED ON FRIDAY) before heading out and around Chicken Rock! Well done to Jenny who paddled well, and got her first visit of the remote Lighthouse. Thanks to John for an excellent paddle. John is presently working towards his BCU 5* Sea Award. A few pics from Saturday, despite windy conditions at the original venue, the chosen location was ideal. A Cracking day, with the sumptuous BBQ to finish! 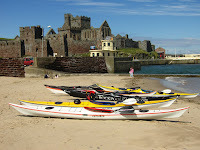 Explorer Series - Round Isle of Man Race! Peter Oakley (and his wife Penny) travelled over from the UK and was the only entrant to the Race this year, due to adverse sea conditions and wind putting all other 'would be' competitors off. Peter was racing the 14 hours, 7 minutes time put in by Freya Hoffmeister at last years Adventure Week. Peel was looking very fine as usual. Photo's are courtesy of Penny Oakley, who was land support for her husband Peter on his trip. Both attended the Festival Weekend prior to Peter setting off. Base Camp was at Ballabrooie camping field. A very organised set-up, it was a pleasure to see all safety measures had been taken and thought through. Look closely to find Peter rounding Maughold Head! Peter finished his trip at Ramsey. A steady F5 head Wind up the entire East Coast reduced the enjoyment and made a winning time very difficult. Peter and Penny than headed to the Point of Ayre where they joined a fair few people watching a Basking Shark in the waters near the shore. Follow up Photo's .... finally! I've chosen a couple from the vast selection that people have sent to me. A gallery will go online shortly, with a bigger selection of pics. The rougher sessions proved very popular this year! Congratulations to Janet Taylor, John Scott and Kieron Stout who all passed the BCU Coach 3 Sea Award, and to Jukka Linnonmaa from Finland who completed his BCU Coach 3 Sea Training with the other 5 candidates and then passed his BCU 5* Sea Award as well! The 5* Training had candidates attending from all over, and was a great success. Despite Adventurous conditions, the Festival Weekend and evening socials went on ahead and all had a terrific time. Many thanks to the Vancouver Island Youth group for the Saturday evening presentation on their recent expedition, and to Manx Ceilidh Band, King Chiaullee for a very lively evening after... Looking forward to seeing you again next year. Corporate Team Challenges - Day 2. A couple of surprising experiences kept everyone smiling! Cave exploring was great fun, and a few seals kept popping up along the route. Then it was time to head back to the Castle. Then to Ballabrooie for homemade lunch again, terrific! The last Team task was the afternoon Raft Building / River Crossing. Both teams finished well inside the time limit. The 'Culvert Crusaders' had a bit of a spill, with someone getting a little wet...Guess who? Great weather today, which was ideal for Day 1. of two days of Corporate Team challenges , ran at Adventurous Experiences base at Ballabrooie. After navigation training, the teams deciphered their routes and successfully completed them, arriving back in time for homemade soup and bread, followed by a delicious pudding. Close rivalry and nearly even points from the 'Culvert Crusaders' and 'Team Handrail'.